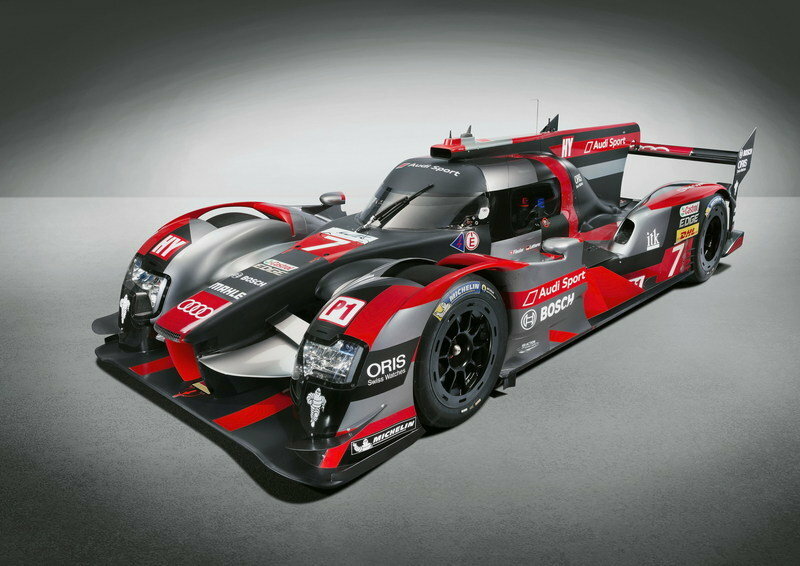 Audi is ready to win the 2016 season with its revamped R18 race car. Until the 1980s, Audi wasn’t an important name in motorsport, with its most successful race cars having been built in the 1930s when the brand was part of Auto Union. Things changed dramatically when the Quattro was introduced in 1980, spawning models that went on to dominate the rally scene and the Pikes Peak hill climb. After laying low in the 1990s, Ingolstadt decided to tackle prototype racing and created a series of vehicles that went on to dominate the competition, as well as the 24 Hours of Le Mans. Its most important racer, the R18, hit the motorsport scene in 2011 and went on to win the 24 Hours of Le Mans four times in a row before being defeated by the Porsche 919 Hybrid in 2015. For 2016, Audi has redesigned the R18 from the ground up. Launched at the Audi Sport Finale at the Audi Training Center in Munich, the R18 is a significant departure from its predecessor. The LMP1 prototype features not only new aerodynamics, but a modified hybrid system and an optimized TDI engine as well. “With our new Audi R18, we’re setting a clear signal: Audi continues to put the pedal to the metal in motorsport, deliberately relying on TDI – the world’s most successful automotive efficiency technology – at Le Mans,” said Dr. Wolfgang Ullrich, Head of Audi Motorsport. Long story short, the TDI powertrain has become more powerful while requiring less fuel. For 2016, Audi is switching to a higher hybrid energy class, so to compensate for the need to process even more energy, the hybrid system now relies on a lithium-ion accumulator as opposed to the flywheel energy storage system that was used from 2012 to 2015 and has redesigned the cars motor generator unit. 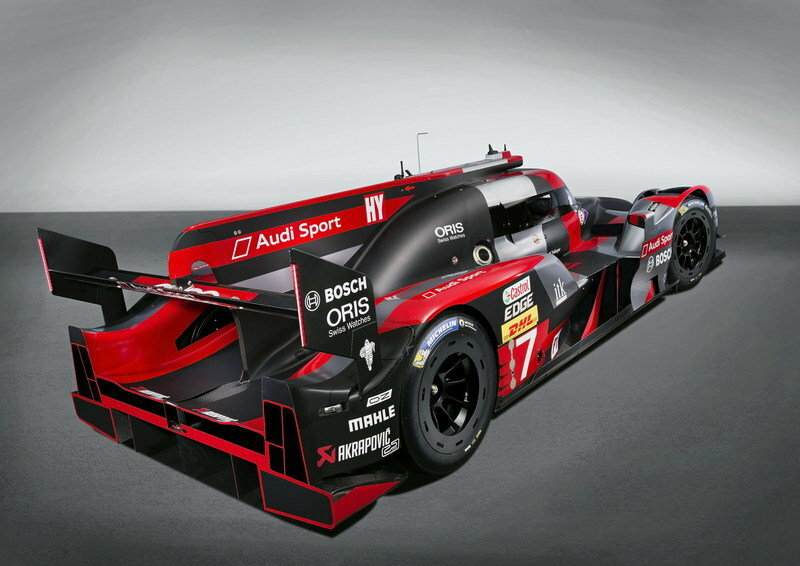 So, with that said, let’s dive on in and look at what is going on with the 2016 Audi R18. 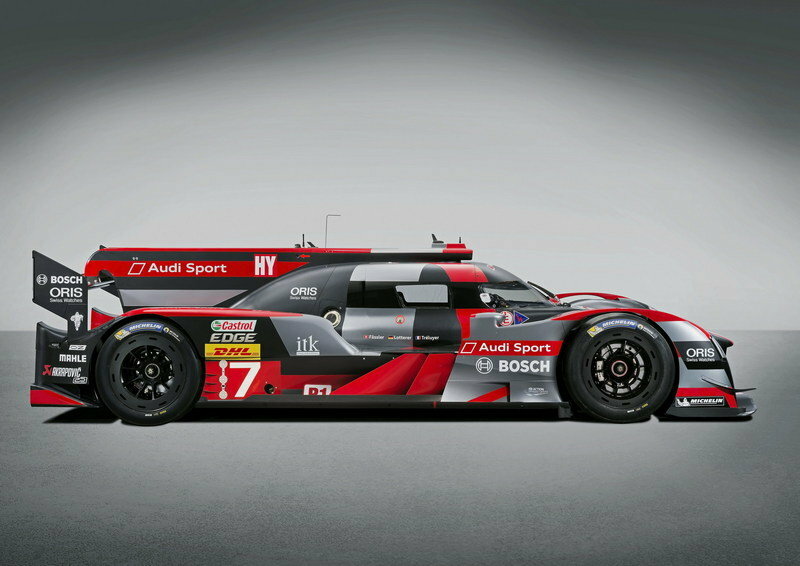 Updated 03/22/2016: Audi dropped the final specifications figures on its brand new R18 race car that will race in competitions like FIA World Endurance Championship (WEC) and the Le Mans 24 Hours. 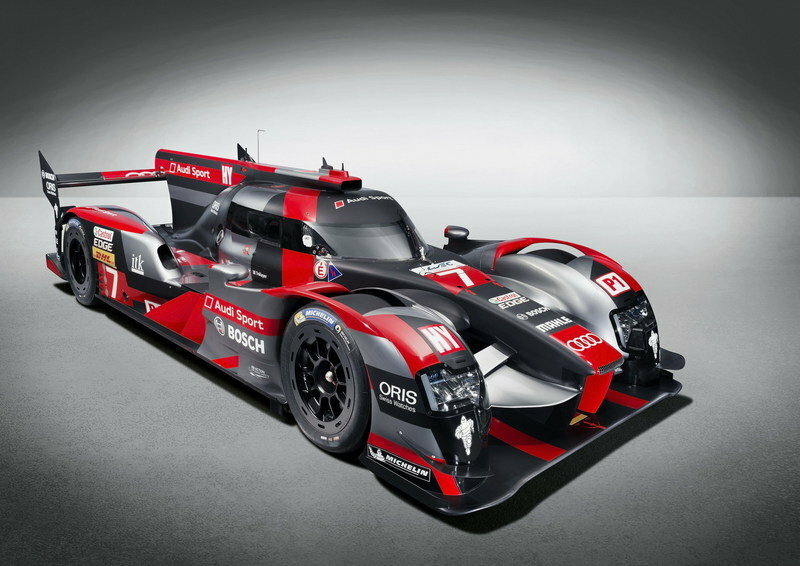 Continue reading to learn more about the 2016 Audi R18. The biggest design changes are visible at the front, where Audi redesigned every little detail in order to improve aerodynamics. The pointy nose sits higher, the fenders have a slightly boxier design with the headlamps mounted farther from the wheels. Compared to last year’s car, the splitter is also closer to the ground, the air ducts have been repositioned closer to the nose, while the traditional canards have been replaced with winglets mounted atop the fenders. Likewise, the headlamps have been reshaped and gained vertical, red LED strips at the extremities. 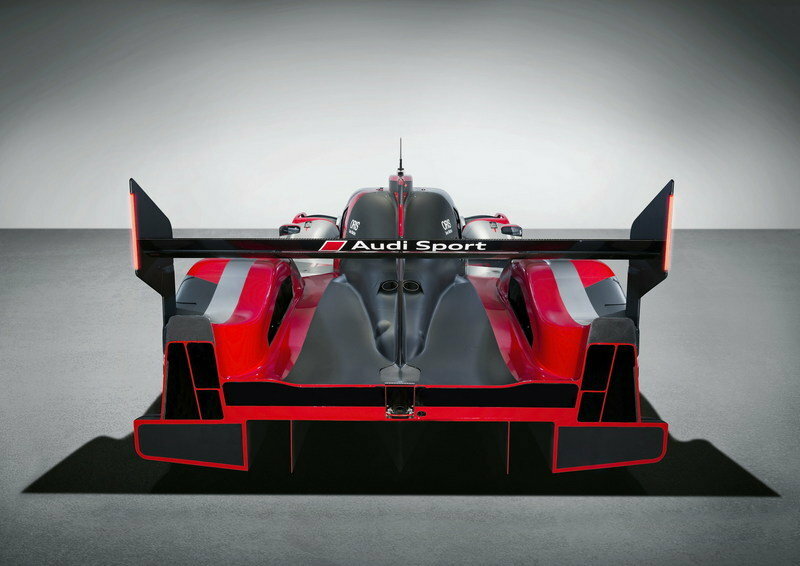 The rear end isn’t as radical as the nose, but Audi made quite a few modifications. 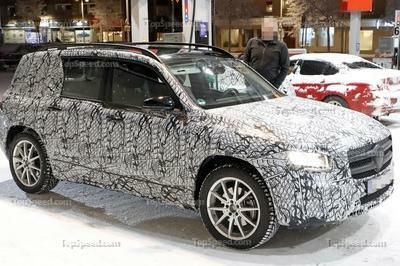 The horizontal strakes behind the rear wheels are gone, while the panels underneath sport a pair of square taillights. On the previous model, the taillights were thin LED strips mounted vertically on the wing. Speaking of the wing, the main posts have been reshaped into a more complex design, with thinner surfaces at the bottom. The diffuser is also different. The large fin between the roof-mounted air scoop and the wing remained unchanged. More modifications are visible on the sides in the form of reshaped fenders, new air vents underneath the doors, and redesigned cockpit windows. 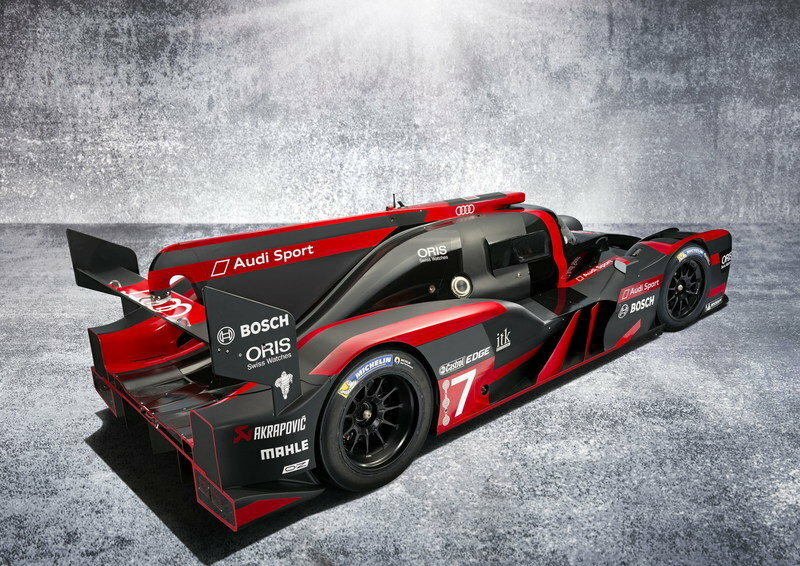 Finally, Audi created a new livery for the presentation car, which no longer features the white and gray hues seen on the previous model, but only black and red. From an aerodynamic standpoint, the body has been designed to reduce undesirable vortices and turbulent airflow. 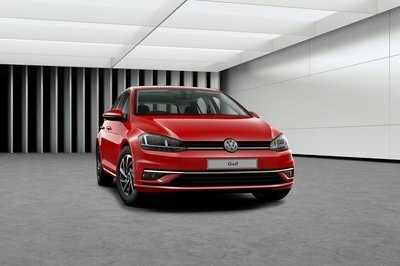 In the front, the nose is slimmer than previous models, and airflow is directed over the top of the car and between the wheel wells. From there, the air enters the cooling ducts in the body shell, where it approaches the underfloor. Air is then discharged at the rear through the diffuser, creating huge amounts of downforce under the race car. Also, the openings in the front wheel arches have been increased in size by 45 percent to help reduce lift in the case of lateral airflow. As usual, Audi didn’t release photos or details of the interior, but its safe to assume that the 2016 cockpit is very similar to last year’s race car. The cabin should sport a simple dashboard with numerous buttons, switches, and knobs, a display instead of the standard instrument cluster, and a multi-function steering. A bolstered racing seat with a six-point harness will hold the driver in place during those long endurance events, while an FIA-approved rollcage will keep him safe in the unfortunate event of crash. Since LMP1 prototypes are by no means fancy on the inside, most surfaced should be exposed carbon-fiber and Alcantara. For 2016, Audi is stepping up to the 6-megajoule hybrid class, which means the hybrid system used from 2012 to 2015 just wouldn’t cut the mustard. To start off, the flywheel energy storage system has been axed in favor of a lithium-ion accumulator that is encapsulated within the high-strength safety structure in the monocoque. Up front, a redesigned motor generator unit (MGU) will be responsible for not only driving the front wheels but converting the rotary motion of the front wheels into electrical energy that is stored in the aforementioned lithium-ion accumulator. Essentially the MGU generates electricity when the driver brakes before entering a turn. As the drive accelerates when exiting the turn, electrical current flows the opposite way, allowing the MGU to drive the front wheels and help accelerate the race car. Le Mans regulations allow for any desired amount of energy recuperation but limits the output of energy to just 408 horsepower. The MGU on the R18, however, has been designed for an output of 476 horsepower in an effort to recover as much energy as possible. 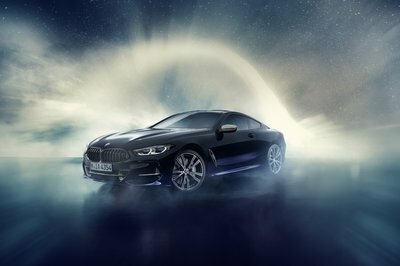 Because the system will be limited to an output of 408 horsepower, the hybrid system will be governed, making the stored energy from the hybrid system available for a longer period of time. Speaking of the MGU, in 2012 that unit put out just 204 horsepower of electrical output, and now we’re looking at the ability to pump out almost 500 horsepower. That’s a pretty wild achievement. The MGU for this year is similar to those used in previous years, but the power electronics, stator, and rotor are all newly developed to bring such an increase in power output. Power is transferred from the MGU to the front wheels via a limited slip differential, allowing torque transfer with minimal loss of torque. Now, let’s take a look at the diesel-powered TDI engine. In 2011, the TDI powerplant displaced 3.7 liters, but in 2014, it was reworked to displace four liters. The same 4.0-liter TDI V-6 is still used in the 2016 R18, but it underwent a few changes. It still has the 120-degree cylinder angle, has four valves per cylinder, a Garrett VTG turbocharger, direct diesel injection, an aluminum crankcase, and is fully stressed. Total output: 514 horsepower and more than 626 pound-feet of torque. Individual external components have been rearranged to accommodate for the new aerodynamic design, and the engine now uses a lighter and more efficient turbocharger. All told, the current V-6 TDI consumes 32.4 percent less fuel than in 2011, and at Le Mans it uses 46.4 percent less fuel – if that isn’t something to brag about, I don’t know what is. During the time acceleration boost is provided by the MGU, the R18 is all-wheel drive. When combined with the 408 horsepower (regulated at Le Mans) produced by the MGU, total system output is 914 horsepower. When unregulated, the MGU can pump out 474 horsepower bring the total system output up to 988 horsepower. During the time acceleration boost is provided by the MGU, the R18 is all-wheel drive. Once the MGU runs out of energy, the 4.0-liter sends power to just the rear wheels via a six-speed racing transmission with a CFRP clutch. Like the front, there is a limited slip differential in the rear, with power sent from the diff to the wheels via constant-velocity tripod-type plunge joints. Steering is handled by a servo-assisted rack and pinion system. Both front and rear suspension setups are independent on upper and lower wishbone assemblies. Upfront a pushrod system is used, while a pullrod system is used in the rear. The dampers are adjustable, and two wheel tethers are used per wheel to help prevent the loss of wheels in the event of a collision. The R18 uses a hydraulic dual-circuit braking system with monoblock light-alloy brake calipers and carbon fiber brake discs in the front and rear. The car rides on OZ magnesium forged wheels that are wrapped in 31/71-series 18-inch Michelin radials. Maximum fuel capacity sits at 49.9 liters. Having won both the World Endurance Championship and the 24 Hours of Le Mans race in 2015, the 919 Hybrid is the car to beat in 2016. Powered by a 2.0-liter V-4 engine and two energy recovery systems, the 919 is likely to receive a number of changes for 2016, but Porsche has yet to reveal its updated prototype. However, the LMP1 racer is expected to sport a similar design and improvements in recovery and storage system areas, as well as a mild output improvement. 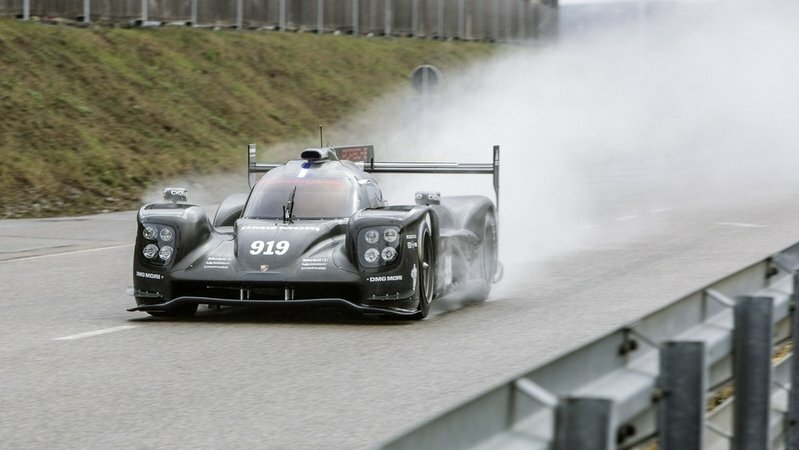 Find out more about the Porsche 919 Hybrid here. 2016 will see a new Toyota prototype hit the track, with the Japanese having already confirmed it will abandon its existing 3.7-liter V-8 powerplant for an engine of undisclosed configuration at this time. The brand will also switch from a super-capacitor to a battery energy-storage system and prepare a new aerodynamic package for the TS050. A turbocharged gasoline engine is likely as Toyota aims to move in the eight-megajoule subclass of the hybrid category. 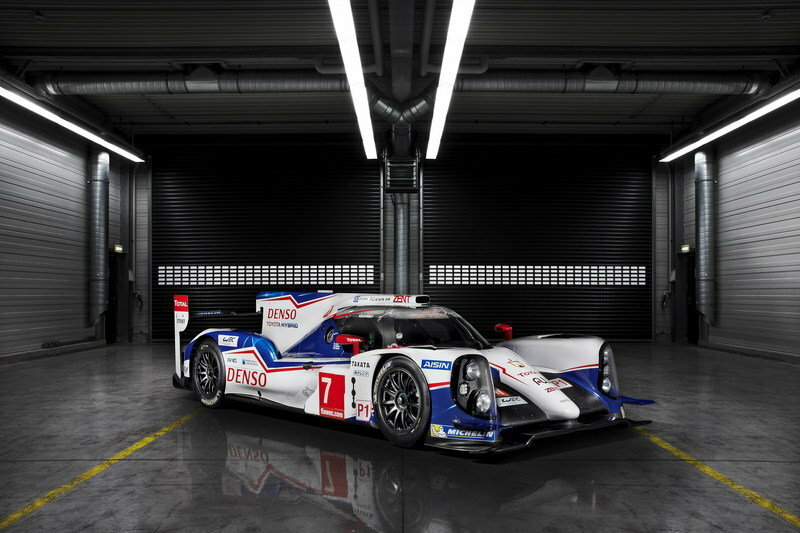 Read our full review on the Toyota TS050 Hybrid here. Launched in 2015, the GT-R LM Nismo is a radical take on the LMP1 class. Using a front-mounted engine that sends power to the front wheels, the Nissan is the opposite of what Audi, Porsche, and Toyota bring to the track and a rather exotic appearance for the entire motorsport scene. Although the Japanese race car failed to make an impression in 2015, it’s expected to return better results in 2016, when it will be able to run a full season. 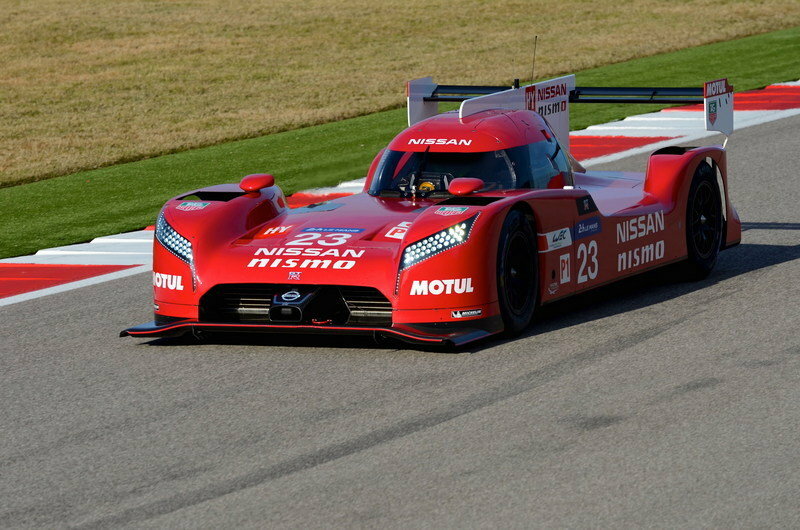 Read more about the Nissan GT-R LM Nismo here. Having been defeated at Le Mans for the first time in five years in 2015, it’s no surprise that Audi decided to give the R18 a comprehensive makeover. With an updated MGU, a reworked diesel engine, and a new energy storage system, the R18 is now faster and more efficient that last year’s model. 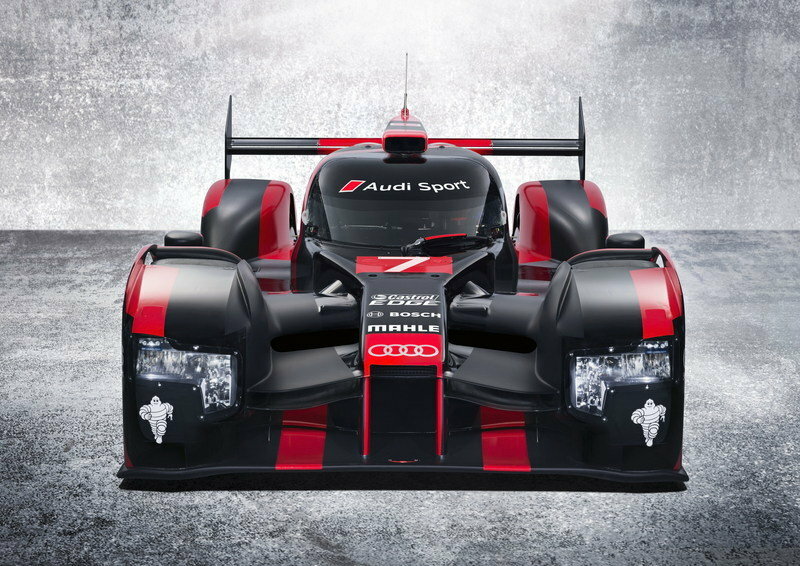 Plus, you’ve got to hand it to Audi for jumping into the 6-megajoule hybrid class after suffering that loss last year. Thanks to the reworked aerodynamics and the light turbocharger, there is no loss of torque despite the lower fuel consumption and we’re excited to see how thing pan out for this season. 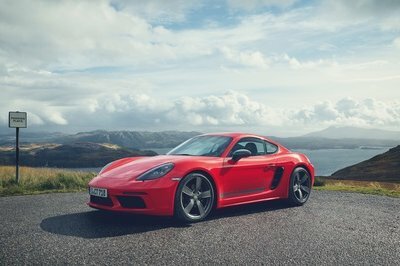 Did Audi do enough to combat Porsche, Toyota, and Nissan? Well, we’ll have to wait to see, but it should be an interesting season. That is one thing you can be sure of.